for the vertical side elements of the lining. Actual sizes of particular linings will depend on the angle of the roof and its thickness. 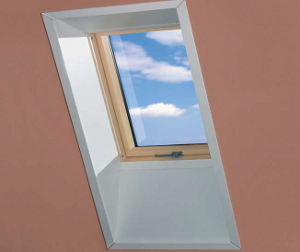 The XLW-F is designed to be installed solely with wooden windows, whereas XLW-P with aluminium clad plastic windows There are available XLW-FD internal linings for FYP-Y proSky and FDY-V Duet proSky windows - to individual order.